It is a common experience to look at a Fayum Funerary Portrait and see a familiar face. I have recently been watching Andrew Graham-Dixon's wonderful documentary series The Art of Eternity, which tracks the course of Religious Art. In the first program of the series, there is a fascinating look into Christian Coptic Art, as well as the very first official Roman Christian art as seen in the era of Constantine I (272-337 CE). 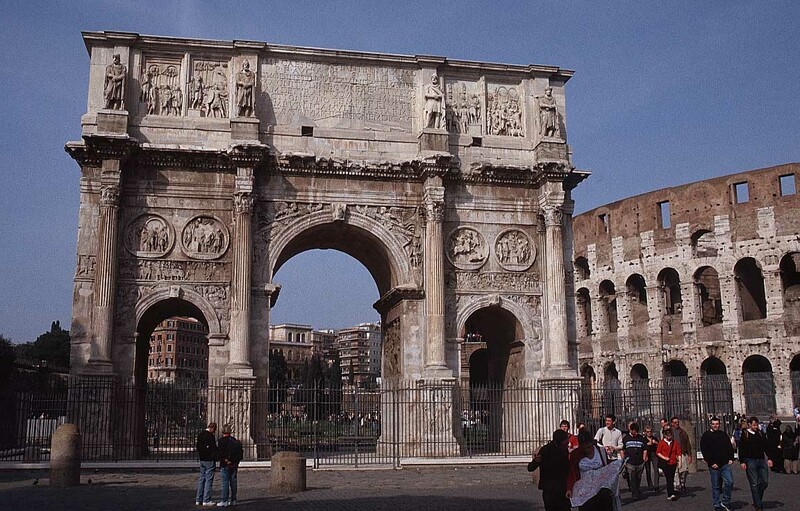 The Arch of Constantine records the instant of stylistic change in stone. Elements of the Arch are depicted in traditional Pagan Roman style, whereas other friezes are a stark departure from this. As someone primarily focused on the Renaissance it was fascinating to see the progenitors of the forms that led to the depictions of religious subjects by Renaissance Masters from Giotto to Donatello, Raphael and beyond. Stirrings of the progression that led from the naturalistic forms of Pagan Classical Art to the stylised Christian depictions evident in the Byzantine and Medieval eras is foreshadowed in the Arch of Constantine - which post-Petrarchan men of the Renaissance such as Vasari and Raphael saw as signs of the entry of barbarism into the art of antiquity. Andrew Graham-Dixon is joined by Heather Robbins of the University of Toronto in this very interesting clip looking at the Christian imagery in the Santa Costanza Mosaics. 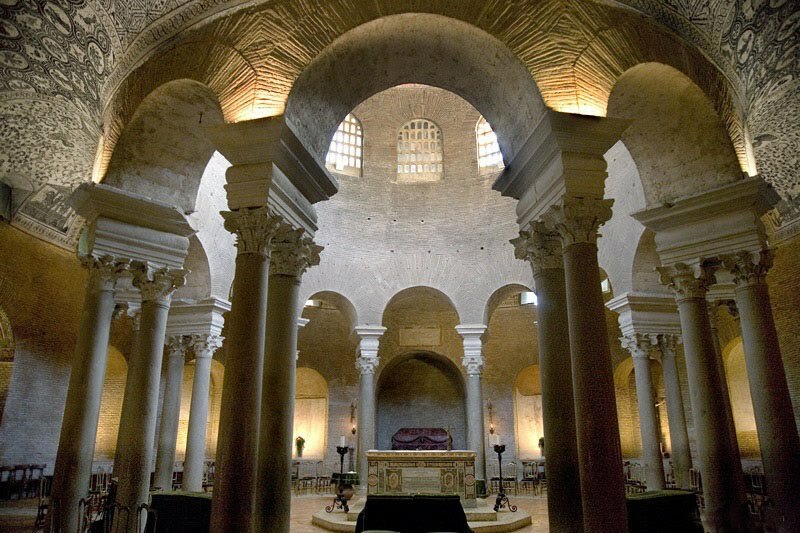 Something quite fascinating was the Early Roman Christian Art evident in The Mausoleum of Emperor Constantine's daughters Constantina and Helena. With the beatification of Constantina in 1254, the building was consecrated as a Church and is now known as Santa Costanza. A translated version of the official page of this monument can be viewed here. This Mausoleum mosaic is perfectly poised between a very archetypal Roman style, intermingled with Christian symbols. Moving on from Rome itself, we look to Ptolemaic and Roman Egypt for another direct connection between the Greco-Roman Classical style and the Christian forms that were to follow. No better example of this secular to spiritual transformation exists than the Fayum Funerary Portraits. These were predominately discovered around the Fayoum Basin in Egypt in the early 20th Century. These stunning portraits were produced in a period between the First and Third Century CE. Since their discovery, they have captivated the world with their stunning realism, giving us a direct glimpse at 'ancient' faces which on closer examination, do not look truly ancient at all. There is indeed something hauntingly familiar and deeply human about these images. It was particularly interesting to see this small snippet where Mr Graham-Dixon travels to the Egyptian Museum in Cairo - not to look at King Tut but the mysterious Fayum portraits. His all-too brief encounter with the Dr. Zahi Hawass was interesting, but ultimately frustrating as the swaggering Egyptologist did not seem to care much for a deep discussion on the origins of the portraits - in fact he wasn't even aware of the intact portraits that were still affixed to the mummies that were on display a mere few metres from where he was being interviewed! Dr. Hawass is notorious for being dismissive of others. His great achievements in archaeology and ongoing campaign to return artifacts to Egypt are perhaps his saving graces. One can not help but feel that Dr. Hawass was being discourteous in allowing a mere 10 minutes with someone as knowledgeable and accomplished as Mr. Graham-Dixon. More at home with American Talk-Show hosts and actors as co-presenters, I have a feeling Dr. Hawass wasn't really the best candidate to engage on a discussion of Greco-Roman Art, whether it was stuck on a mummy or not! I wondered if it was par for the course for Classicists to be so rude to art historians. Reading Mary Beard's recent ill-titled blog entry Don't do Art History and seeing clips like this makes me wonder at the relationships that exists between these two professions! That aside, the Fayum (and related) portraits belong to a style known as encaustic or 'burnt-in' painting. There is a wonderful online article on it by Michael Lahanas. Please see the clip below for a montage of a large selection of the portraits, courtesy of YouTube user akanthoss. Perhaps what is most striking about the Fayum portraits are that in many ways the faces are so familiar. Watching the montages of these clips and discussing them with friends and colleagues - it is a common experience to see a face that reminds you of someone in your own life. It is disconcerting to know there are divisive arguments of a political nature about the nationality of the persons depicted in these portraits. 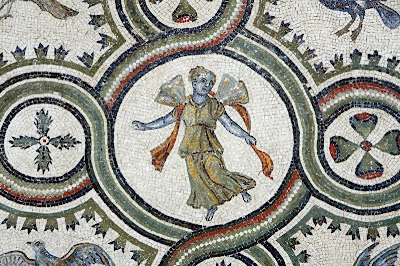 The rest of us, as lovers of art and history, can put that aside and celebrate these wonderful gifts from antiquity as treasures, giving us a touching look at the very familiar gleam of humanity that radiates from these stunning images. A Fayum portrait still affixed to its jewel-encrusted mummy case. H-what a wonderful post! And I agree, the Fayum portraits are stunning in their ability to convey, as you put it, the "familiar glimmer of humanity." The Fayum portraits of children, especially, deeply move me because it's almost as if you can hear the echo of their laughter when you look into their eyes. Thanks for the videos too--there were many portraits that I had never seen before. I went to a talk by Euphrosyne Dioxiadis (I hope I spelled that right) who is one of the major experts on the Fayuum Portraits. She wrote a book about them called The Mysterious Fayuum Portraits which is excellent. I haven't read Euphrosyne's work, it looks great! Definitely goes on my reading list - thanks for that! There are also 2 more works listed on this topic, one by Susan Walker in 2000 and another by Berenice Geoffroy-Scheitner in 2005. I'm catching up on blogs tonight! I was intrigued by that clip with Dr. Hawass. I think his career is so bizarre, since he is such a celebrity figure. He's done some good work, but I also think that he throws his weight around. Anyhow, I wasn't really surprised that Hawass wasn't aware of the Fayum portraits in the museum (I assume that this is the Cairo Museum, right?). Last week I was watching the documentary Secrets of Egypt's Lost Queen, and I was surprised at the disorganization in the Cairo Museum. Staff members had a hard time locating mummies and other objects on display; several clips showed staff members running around for a long time, trying to find different artifacts. (I'm guessing that their cataloging system is a mess!). Anyhow, after seeing that earlier documentary, I'm not surprised that Dr. Hawass wasn't aware of the Fayum portraits on display. It seems like no one really knows exactly what objects are located in that museum. What a mess! 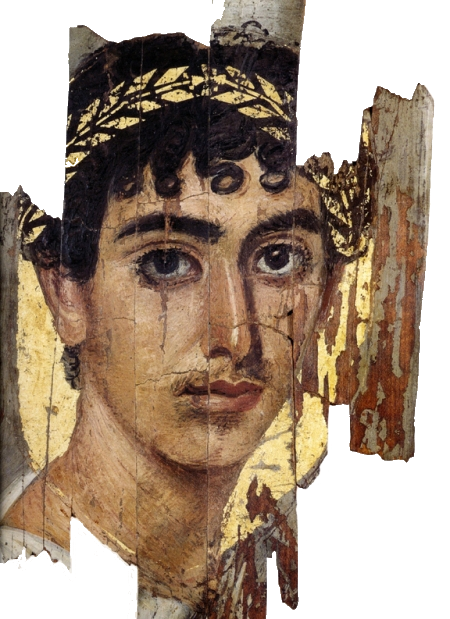 I think the Fayum portraits are really beautiful. I completely agree with you: there is something very familiar and haunting about the people depicted on those mummies. Cheers M! Sounds like they definitely need to get organised over there! One can understand how established Museums are expressing concern - not about returning artefacts to Egypt, but whether the Cairo Museum etc. is equipped to properly catalogue and conserve these items. As for the familiarity aspect of the Fayum images - I totally agree - I chose the image at the top of the post because it was reminiscent of myself as a youngster! I had Greek, Turkish, Lebanese and Italian friends who looked quite similar too. We even have a phrase for this in our respective languages, which translated into English as "one face, one race" - celebrating the human and physical similarities between peoples of the Southern Mediterranean and Middle East, as opposed to the Cultural and Religious differences. Interesting, that they showed her wrinkles. Mary Beard and Bearded Lady! Thank you for your input. @Mary Beard - I of course knew the main thrust of your original blog post was to express the pitfalls of image permissions, something which plagues writers of all genres and formats. I think the key is spreading information about useful resources, as the responders to your blog post did, which was also explored in my recent interview with Vicky Alvear Shecter. @Bearded Lady - cheers for the link - the colouring and stylised depiction on that particular portrait looks much more in line with the Coptic Christian style...very interesting to see such variation! I enjoyed reading your information on many subjects and appreciate looking at the many Fayum portraits, one after the other. Yes they are familiar particularly in the global world we live in.